Backed by years of professional experience, we are involved in offering an excellent quality Colour Sand, quartz sand and industrial minerals. The offered sand is processed using fine grade chemical compound and cutting edge technology under surveillance of our experts. Before delivery, the offered sand is thoroughly tested on various parameters by our quality assurance team. 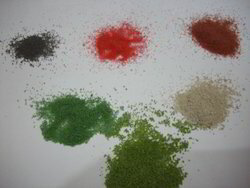 The offered sand is made available to our clients at market leading prices. Looking for White Quartz Grains And Powders ?